Archives : RISING THREE METHODS - 15/06/2012. RISING THREE METHODS – 15/06/2012. Just when there seemed little hope, the Bulls led a strong counter-attack and both the indices bounced off their support levels two weeks back, but not before registering fresh intermediate lows i.e. Sensex 15748 and Nifty 4770. The important aspect is that the majority of the oscillators signaled a positive divergence when the indices made fresh lows. Both the indices recovered making strong Bullish Engulfing pattern at the bottom which not only engulfed the previous week’s body but also the shadows. 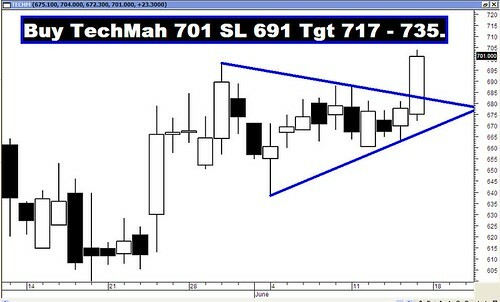 The candlestick formation, this week, suggests continuation of bullishness. The Pull-back levels in this case will be 16808-17136-17463 for the Sensex and 5098-5200-5301 for the Nifty. Sensex opened the week at 16804, made a high of 16967, low of 16553 and closed the week at 16949. Thus it registered a weekly gain of 231 points. At the same time the Nifty opened the week at 5096, made a high of 5146, low of 5015 and closed the week at 5139. Thus the Nifty went up by 71 points on a weekly basis. On the daily charts, both Sensex and Nifty have formed a Rising Three Methods which is a Bullish Continuation pattern formed over a period of last four days. After forming a big white body candle on Tuesday; Wednesday and Thursday saw small body formations (like rest days) which were inside the Trading Range of the Tuesday’s bullish candle. On Friday, there was a gap up opening and formed a big white body candle such that the closing was the highest in last four days. This marked the resumption of the uptrend. On the weekly charts there is a small white body candle formation with a long lower shadow suggesting support coming in at lower levels. This is a continuation of Bullishness. Thus candlestick formations promise more bullishness in the short term. After making an intermittent low of Sensex 15748 and Nifty 4770, the markets are witnessing a strong pull-back. The Pull-back or Retracement levels are at 16808-17136-17463 for the Sensex and 5098-5200-5301 for the Nifty. Both Sensex and Nifty tested the long term average of 200dma (Sensex – 16798 and Nifty – 5071) for the entire week and finally managed a weekly close above that coveted level. Also the indices are above the medium term average of 50dma (Sensex – 16712 and Nifty – 5070) and the short term average of 20dma (Sensex – 16390 and Nifty – 4972). As a result, the trend in the Long term timeframe, Medium term timeframe and the Short term timeframe are all Bullish. Both Sensex and Nifty have given a bearish breakout for the Falling Wedge pattern. The target as per this breakout falls at Sensex 15728 and Nifty 4742. But more often than not, a bearish breakout in a Falling Wedge is likely to result in the indices moving towards the point from where the rally has started and i.e. Sensex 15135 and Nifty 4531. The lows registered two weeks back (Sensex 15748 and Nifty 4770) are very close to immediate target of the Falling Wedge pattern; hence the immediate target has been achieved. The long term target will stand negated if the Sensex closes above 17432 and Nifty above 5279. Market has now once again gone above the level of the Falling Channel Top which comes in at Sensex 16346 and Nifty 4940. These levels should now provide Support for the market. The overall bullish long term target for Falling Channel pattern breakout remains intact. The targets as per this formation are Sensex 20383 and Nifty 6148. There is a strong Resistance formed by the confluence of the 61.8% of the immediate fall (i.e. from Sensex 18523 to 15748), 38.2% of the entire fall (Sensex 21108 to 15135) and the immediate previous top (17432). Thus the Sensex has a strong Resistance zone of 17417–17463. The confluence zone for the Nifty has been formed by the 50% of the immediate fall (Nifty from 5629 to 4770), 38.2% of the entire fall (Nifty 6338 to 4531) and the Bearish Falling Gap (5217-5226). Thus the Nifty has a strong Resistance zone at 5200-5226. MACD and ROC both continue in their Buy mode and are in positive territory. RSI is above 60 suggests bullish momentum to continue. Stochastic Oscillator has given a Buy as %K is above %D, but (%K is at 90) that is in overbought territory. MFI (67) continues with its Buy mode and so does the Directional Indicators as +DI is above –DI. ADX has fallen to 21, which suggests that the downtrend has lost much of its strength. The OBV has started making higher top, higher bottom formation. Bollinger Band had signaled a Buy two weeks back and it continues in its Buy mode. Interestingly positive divergence was seen in RSI, MACD and MFI when the market made a fresh low couple of weeks back. The Nifty O.I. PCR has increased further to 1.77 suggesting that the confidence of Put writers is increasing. For the June series, highest open interest buildup is seen at 4800 Put and 5200 Call. On Friday the 5100 Put has added significant open interest which suggests the undertone of the market is increasingly turning bullish. Overall the Nifty is likely to range between 4800 on the lower side to 5200 on the higher side. Trendline Resistance for the Sensex is at 17042. The Trendline Support is at 16597. Trendline Resistance for the Nifty is at 5213. The Trendline Support falls at 4999. For the week ahead, Sensex will find Support at 16658-16366-16068 and will find Resistance at 17242-17530-17832. For the week ahead, Nifty will find Support at 5047-4956-4866 and will find Resistance at 5226-5322-5413.